In the first of our two season 17 launch shows we welcome Marius, who is just marvellous, to the Gunge Tank. We always try to find the best possible faces to launch our next season of Splat! Shows. It’s never a easy challenge but when the search goes right, it really does plays off. Case in point with Marius when we were told a while ago was interested in coming to shoot a show with us. Fast forward three months and it’s finally happened. Does Marius live up to the launch show stars of the past? Short answer is a BIG YES. If you want the longer answer, we recommend you stop reading now and download his marvellous show. 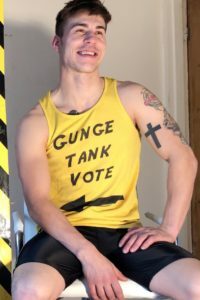 The Gunge Tank Interview: Of course it’s back! We love a good chat with our guests and especially more with brand new ones! 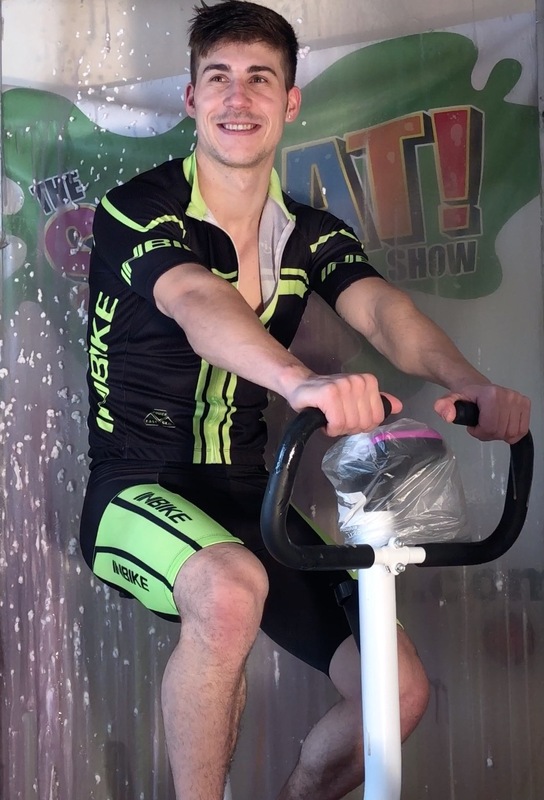 We interview Marius inside the Gunge Tank and then give him his first ever Gunging. Did we make a new Gunge Fan? Find out. Lucky Or Mucky: The Return! : After taking a break last season, the Splat! Show classic game Lucky or Mucky is back! This season we will be making alterations to this classic game as the season progresses. Marius plays a slightly tweaked version of Lucky Mucky. The risk is that Marius will gunge himself if he is unlucky and pulls the cord releasing the tank above his head. Each incorrect answer Marius has to select a number, it that number is unlucky he then has to select a cord. How far will Marius get? Or will he get mucky very quickly when his luck runs out? Foam Me Up: We know, we know, yes Foam me up is back. We know we said we was going to retire the game for this season but it’s just too good and popular to shut away for an entire season. So it will appear a few times this season and we are kind of glad we did it with Marius because, yep you guessed it, it is marvellous! Marius takes on a round of the popular foam me up with the ever threat of a tanking if he get’s completely foamed up! The Splat! Debrief: Has Marius recovered his breath from his Tour De Gunge to even talk to us? We find out as we chat to him in the debrief. What did Marius enjoy (spoilers, the gungy bits)? Will he come back? Does he want his final Gunging of the show (again spoilers, of course he did). We loved having Marius on the show and we really hope you have fun watching! Video Details: Video Length: 52 minutes and 52 seconds. Presented in 4k and HD. Help playing videos. A small selection of stills taken from the video for Marvellous Marius. Marius took on our famous Splat! Storm for the pre-shoot exclusive. Only available to viewers who ordered before the close date. Not currently available on the website. Marius was up against Oliver in the Gunge Tank Vote. Viewers voted for Oliver to get the Gunge so Marius had to play The Great Gunge Tank Escape.